Posted on 22 July 2017 at 8:00 am. This has been my year of making steps. It started the weekend of my 50th birthday celebrations and now is at the ‘minor improvements’ stage. I have lived at this house for many years but my relationship with the river bank has really changed in the last 12 months. It started when the access we had to the beach further down the river changed which meant that although we live on the river, there is no easy way into it from our garden as the banks are too steep. So I spent the autumn cutting back trees and clearly the banks so we could at least see the river and so that I had a spot where I could do yoga and meditate by the river. Then the spring came and with it hurricane Bertha who took down one of the huge trees at the river side. Our neightbours chain sawed and I spent hours with a hand saw cutting back what had fallen. 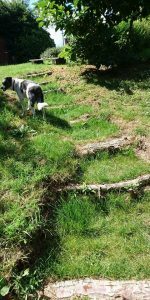 When I looked at the muddy bank and the fallen tree I decided it was time to create steps down to the river and that I would use the fallen tree make them. And they worked. I grass seeded and watered and now we have steps down to the yoga spot. 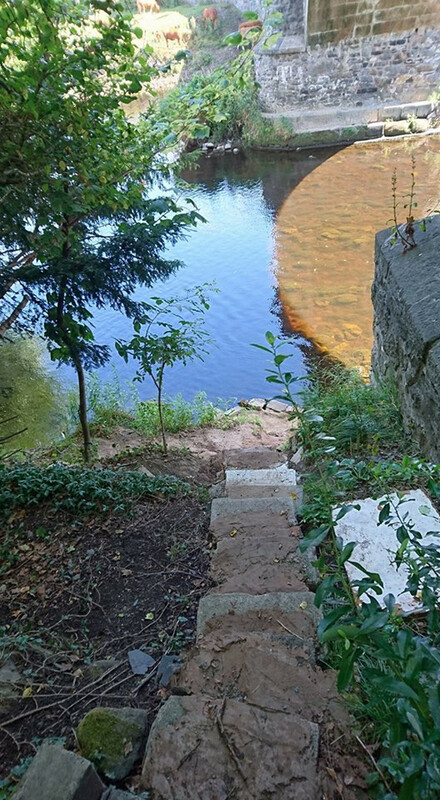 But the yoga spot is no good for getting canoes, children and dogs into the water so I needed to make steps down the steeper part of the garden to a shallower part of the river, under the bridge. This time I use reclaimed blocks and I learned to cement. I learned that post cement doesn’t work for steps but it OK for covering bumpy ground. I learned that you need to tamp the ground down hard before you use cement and I learned not to get my fingers caught between heavy blocks because it hurt so much I thought I was going to be sick. You have to have an idea of where you want to go to even if you’re not sure how to get there. Learn from other step makers and takers. I have a load of photos I took of steps which I liked. Sometimes it helps to read-up on things to learn how to do them, and sometimes this is just procrastination. I just did it. No reading, no googling. Just do it. You can do anything if you take it one step at a time. Literally. I would do one step and evening, sometimes less depending on how tricky the step was. You have to be guided by the landscape of what is already there. The curve of the grassy steps was defined by the curves of the garden and the steep incline of the concrete steps were necessary because the bank is so steep. Going against what is already happening would have been exhausting and pointless. Sometimes taking steps hurts. This happened when I was trying to move too fast or do too much. Building steps to where you want to go takes the time it takes. It all depends on how you look at the steps and only your opinion matters. My steps are beautiful from the angle of the photo at the top of the page, but at the bottom is another photo where they don’t seem quite so lush. So perspective matters, how you see your steps is all that matters. Your steps are not for everyone. Not everyone would want to, or be able to walk down my steps. They are imperfect, uneven and steep. My kids and the dogs can bounce down them and so can I. The steps don’t need to be for everyone, just for the people who want to join me in walking them. Building steps takes commitment. I did something on my steps every day, if only a little something. Building steps means putting the effort in. I carried bricks and blocks and bags of cerement. I balanced in awkward positions. I dug steps. It was hard work. 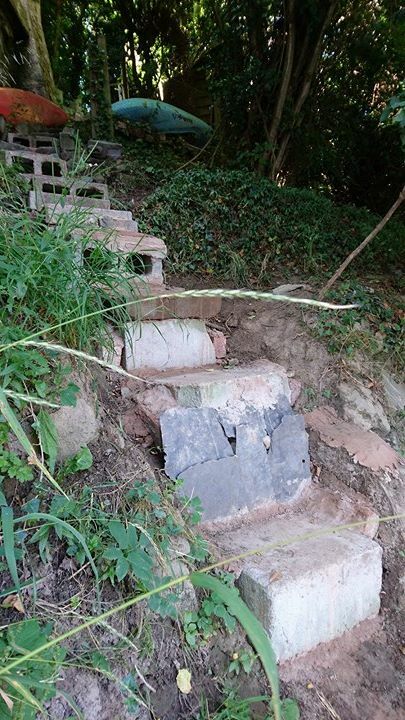 So now I have built my steps we can canoe again. We can paddle. We can throw sticks for the dogs. I can sit and write down by the river. I can watch the kingfishers arrow by. I can watch the swans with their young. I can sit under the bridge and watch the bats swoop. I can sit on the bank and meditate. It was worth making those steps, slowly, one step at a time. What could you do if you just took one step at a time?